the animals were exposed to continuous environmental conditions, not the normal rise and fall of temperature and humidity that would be experienced by dairy cows in the real world. Many of today’s high yield dairy cows produce an average of more than 30 kg/day and up to 50 kg/day at peak production. Recent research has shown that the impact of heat stress on milk yield occurs much faster and at a lower threshold than previously thought. A reduction in milk can be expected 1 to 2 days following exposure to the environmental condition above a THI threshold of 68. Avoiding a decline in milk production over a 2 day period will automatically prevent a decrease in lactation persistency two weeks later. Bernabucci et al 2010 investigated over a million lactation records and found that milk yield losses were detectable above a THI of 68. 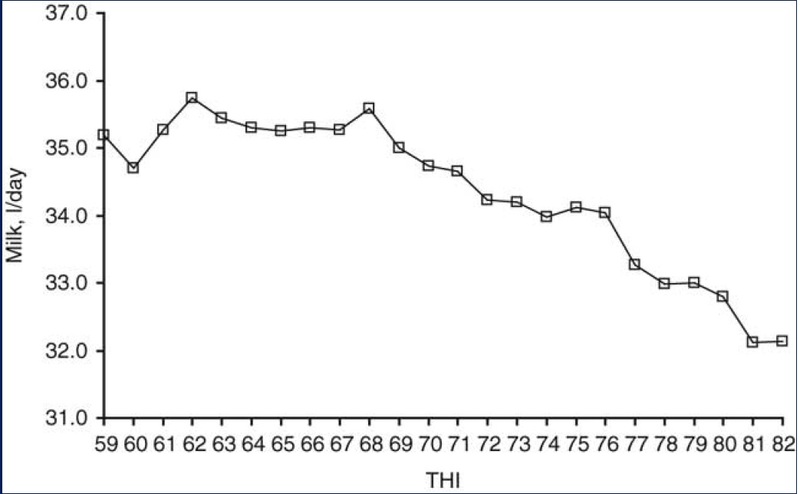 Collier et al 2012 found that milk yield losses become significant when the a minimum daily THI is 65 or the average daily THI is 68. 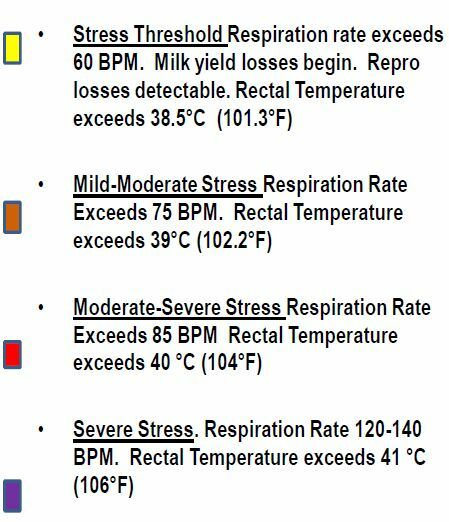 They have also published a new THI threshold chart (see below) that identifies the threshold for milk yield losses and matches THI with rectal temperatures and respiratory rates. PLEASE NOTE: these thresholds are not part of the Dairy Forecast Service and are only displayed here for educational purposes. The research also suggests that in regions where evaporative cooling is not compromised, e.g. arid and semi-arid climates, air temperature alone is as good an indicator of heat stress as the THI. This may be a useful benchmark for some dairy operators to identify at what temperature they observe heat stress effect in their cows even though the current THI suggest otherwise. Local herd adaptation is also important as cows become acclimatised to a location over time, such that cows from southern Victoria would have a different response to the environmental conditions experienced in central Queensland than cows raised there. This acclimatisation process is continuous and cows can move from being acclimatised to unacclimatised based on extended weather conditions. The details of cow acclimatisation are too broad to be covered here, however the key point is that a herds response to heat stress is related to how acclimatised they are to their climatic region. The current alert thresholds, as defined by Dairy Australia may under-estimate the effects of heat stress on dairy cows, depending on your particular circumstances. Heat stress can have a detrimental impact on milk yields much quicker and at a lower threshold and than previously thought and climatic regions and herd acclimatisation can influence milk yield losses from heat stress. To address some of these issues Katestone and Dairy Australia introduced customised alert thresholds for subscribers to the Dairy Forecast Service. Thresholds can be set for daily maximum and average temperature and THI along with the current alert thresholds, that reflect the local knowledge and experience of the dairy operator. For example a dairy in southeast SA observed heat stress in their cows when the daily temperature exceeded 38°C with a relative humidity of less than 10%. Using the current thresholds this condition does not trigger an alert as the THI is below 82 and it did not exceed 78 for more than 3 out the following 6 days. With the customised alert settings this dairy can keep the traditional alerts as well as set a maximum daily temperature alert that reflects the local herd adaptations and climatic conditions at their dairy. Bernabucci, U., Lacetera, N., Baumgard, L.H., Rhoads, R.P., Ronchi, B., Nardone, A. 2010. Metabolic and hormonal acclimation to heat stress in domestic ruminants. Collier RJ, Hall LW, Rungruang S, Zimbleman RB (2012) Quantifying heat stress and its impact on metabolism and performance. Proceedings of ‘23rd Annual Ruminant Nutrient Symposium’, Florida, 2012.